The greater Milnerton area to the north of Cape Town has benefited greatly in the past 10 years from its prime location close to the city centre, and even more so since the introduction of the MyCiTi rapid bus transit system, which enables hassle-free commuting to workplaces in the central and southern suburbs, along the Atlantic Seaboard and in the every-growing Century City complex. To meet the rising demand for homes here, a traditional suburban landscape has also been transformed by billions of rands’ worth of new developments and, says Maria De Villiers, Western Cape regional manager for the Chas Everitt International property group, it now offers a very wide range of residential property options, from trendy studios for career singles and luxury waterside townhouses to comfortable family homes and golf estate mansions. She says the core area known as “old Milnerton” was especially popular a few years ago among young families looking for older properties with large gardens that they could buy relatively cheaply and then renovate and modernize, “but with all the upgrading that has now taken place these are becoming hard to find. For those in search of newer homes, Milnerton also encompasses several security estates, including Royal Ascot, which is made up of a number of separate, gated complexes on the 80ha site of the former Milnerton Race Course, intermingled with low-impact commercial, retail and restaurant outlets to enable residents to enjoy a variety of live-work-and-play opportunities in a single “new urban” environment. This concept has been a spectacular success, De Villiers says, and there is perennial demand for the houses and fashionable apartments in Royal Ascot villages such as La Camargue, Birkdale, Royal Windsor and Willow Range, where prices currently average around R2,3m for freehold homes and R1,33m for sectional title apartments. Set in the lagoon at the mouth of the Diep River, Woodbridge Island houses another lifestyle estate, which is comprised of luxury two to four-bedroom sectional title duplexes on the ocean side of the island and a mixture of duplexes and simplexes in the centre and on the lagoon side, and prices currently average just under R3,2m. And then, she notes, there are the Sunset Beach and Sunset Links estates that boast grand homes built on and around the Milnerton Golf Course, an 18-hole, par-72 links course on a long strip of land that lies between the Atlantic Ocean and river. 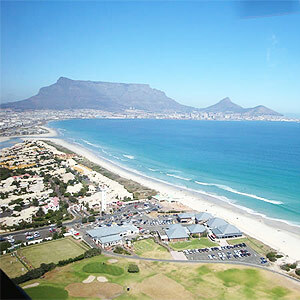 Other nodes in the Milnerton area include the exclusive enclave of Lagoon Beach, to the south of Woodbridge Island, and Milnerton Ridge, to the north-west of Royal Ascot. Prices for the handful of high-end sectional title properties in Lagoon Beach average around R4,5m, while the average for freehold homes in Milnerton Ridge is around R2m. Local shopping centres include Paddocks, The Gallery and Milnerton Mall, and Milnerton also has its own Medi-Clinic private hospital.